Lok Sabha Election 2019 Dates, Schedule News Updates: While polling will commence on April 11, the results will be declared on May 23, Chief Election Commissioner Sunil Arora announced. 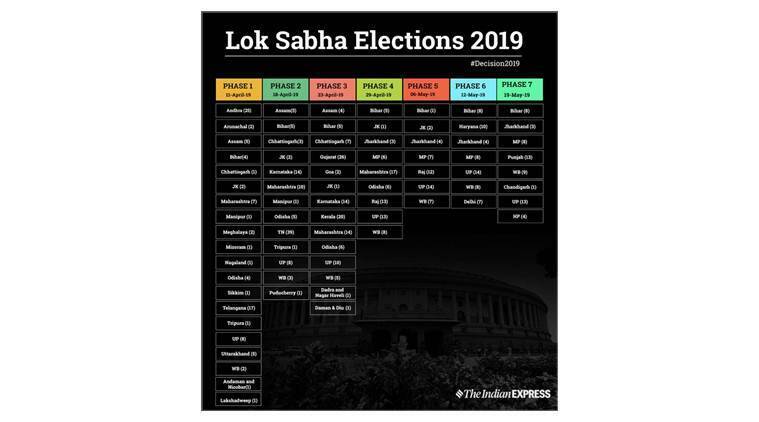 Lok Sabha Election 2019 Schedule, Dates LIVE News Updates: Lok Sabha elections will begin on April 11 and will be held in seven phases, Chief Election Commissioner Sunil Arora announced on Sunday. While addressing the media at Vigyan Bhavan in New Delhi, the CEC announced the date for various phases and said counting of votes will take place on May 23. The Model Code of Conduct will also come into effect from today, he added. The poll panel head also said that assembly polls in Andhra Pradesh, Arunachal, Odisha and Sikkim will be held simultaneously with the Lok Sabha elections. However, elections for the Jammu and Kashmir assembly, which was dissolved after the ruling coalition between the BJP and the PDP fell apart, will not be held during this period, he said. Election Commission announces Lok Sabha poll schedule. Elections to the lone Lok Sabha seat in Nagaland will be held on April 11, PTI reported state Chief Electoral Officer (CEO) Abhijit Sinha as saying. By-election to Aonglenden Assembly constituency will also be held along with the Lok Sabha polls on April 11, the first of the seven-phase election in the country. Sinha said, nomination papers could be filed from March 18 to March 25. Scrutiny of papers will be done March 26 and the last date of withdrawal is March 28. Counting of votes will be taken up along with the rest of the country on May 25. The Election Commission has made it compulsory for candidates contesting polls to advertise their criminal antecedents in TV and newspapers at least three times during electioneering. The ruling AAP in Delhi launched its mega campaign for Lok Sabha polls, with full statehood as its central theme, staging a protest near BJP headquarters here over the issue on Sunday. The Lok Sabha election will decide the fate of the country and also of Delhi, which was badly hurt during the “dictatorship” of the BJP-led dispensation at the Centre, said Delhi AAP convener Gopal Rai. Polls for 29 Lok Sabha seats in Madhya Pradesh will be held in four phases during April 29-May 19 period, state chief electoral officer (CEO) V L Kanta Rao announced Sunday. The elections will be held in Madhya Pradesh on April 29, May 6, May 12 and May 19. In the first phase, six seats -- Sidhi, Shahdol, Jabalpur, Mandla, Balaghat and Chhindwara -- will go to polls on April 29. In the second phase, seven seats -- Tikamgarh, Damoh, Satna, Hoshangabad, Betul, Khajuraho and Rewa -- will go to polls on May 6. In the third phase, eight seats -- Morena, Bhind, Gwalior, Guna, Bhopal, Sagar, Vidisha and Rajgarh -- will go to polls on May 12. 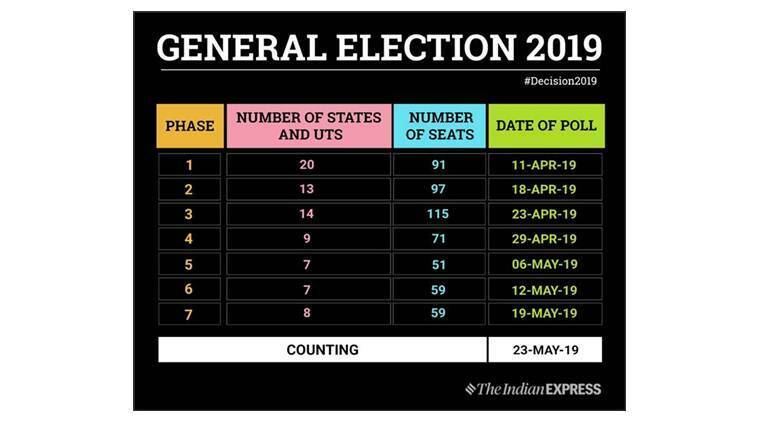 In the final phase on May 19, eight seats -- Dewas, Ujjain, Mandsaur, Ratlam, Indore, Dhar, Khargone and Khandwa -- will go to polls. A bypoll to Chhindwara assembly constituency will be held on April 29. The opposition parties in Bengal, however, welcomed the seven-phase polls saying it reflects the "deteriorating" law and order situation under TMC rule. CPI(M) politburo member Mohammed Salim said, "The seven-phase election reflects the law and order situation in the state... how people were stopped from exercising their democratic rights." He was referring to the violence that took place during the panchayat polls in the state last year. The ruling Trinamool Congress in West Bengal took exception to the seven-phase Lok Sabha polls and alleged the central government had "misled" the Election Commission about the law and order situation in the state. "The central government has intentionally misled the Election Commission with wrong inputs about the law and order situation in the state," senior TMC leader and Kolkata Mayor Firhad Hakim said. Such a prolonged polling process will put a lot of pressure on the people because of the month of Ramzan and the summer in April and May, he added. Lok Sabha polls will be held in four phases in Maharashtra starting from the Vidarbha region on April 11, a top official said. At 48, Maharashtra sends the second largest number of MPs to Lok Sabha, after Uttar Pradesh which has total 80 constituencies. The total number of voters in Maharashtra, as on January 25, stood at 8,73,30,484 as against 8,07,98,823 in 2014. Actor-politician Vijaykant's DMDK joins AIADMK-led alliance, gets four Lok Sabha seats in Tamil Nadu, PTI reported. Soon after the dates were announced, the Congress hit out at the Modi government saying it will be best remembered for "wasting" its historic mandate and that all its promises remained "unfulfilled". Party leader Ahmed Patel, in a series of tweets, said the 2019 elections will herald a new era ending five years of "chaotic, despotic and destructive" dispensation and the country will return to the path of "sobriety, integrity and inclusivity". "NDA 2 will be best remembered for wasting its historic mandate in the pursuit of petty benefits for a handful of individuals, by imposing a heavy cost on the entire nation For 5 years India waited, but Acche Din never came (sic)," he tweeted. Over 4.47 crore electors are eligible to cast their votes for 26 Lok Sabha seats in Gujarat, elections to which will be held on April 23, state Chief Electoral Officer S Murali Krishna announced today. Notification for the election will be issued on March 28 and candidates can fill nomination forms between March 28 and April 4, he added. Scrutiny of nomination forms will be held on April 5, and candidates can withdraw their nomination forms by April 8, he said, adding that the model of conduct had now come into force. "There are around 4.47 crore voters in the state. Votes will be cast across 51,709 booths. Of these 4,47,464,179 voters, 2,32,56,688 are men and 2,14,88,437 women," the CEO said. The Election Commission today said ‘voter-verifiable paper audit trail’ (VVPAT) will be used in all polling stations this time along with electronic voting machines. In order to facilitate the electors in identifying the candidates, photographs of politicians will be used on EVM ballot paper. “This will help avoid any confusion, which may arise when candidates with same or similar names contest from the same constituency. For this purpose, the candidates are required to submit to the Returning Officer, their recent stamp size photograph as per the specifications laid down by the Commission,” CEC Arora said. Click here to know more. Over seven lakh electors would be eligible to vote on April 11 in Mizoram, the state's CEO Ashish Kundra said. Of the 7,84,405 eligible voters, 51 per cent are women, Kundra said. Noting that the state election department was fully prepared to conduct the elections, the CEO said that expenditure for the coming polls would be at least 15 per cent less compared to the state assembly polls held on November 28 last. Deployment of central armed police force would also be "immensely reduced" during the elections, he said. Elections to the seven Lok Sabha seats in Delhi will be held on May 12. According to the final electoral roll published on January 18 by the Chief Electoral Officer, there are over 1.36 crore voters in Delhi. After the EC's announcement today, Delhi Chief Minister Arvind Kejriwal tweeted, "Ultimately back to 'We the people' -- the real power of our democracy. Time to throw out the most dictatorial and anti-federal govt in the history of India. Time to seek answers on demonetisation, jobs, destruction of traders and destroying brotherhood amongst different communities." The announcement of dates for the Lok Sabha Elections Sunday witnessed an array of political leaders tweeting their reactions. Welcoming the announcements of polling dates, BJP president Amit Shah claimed that Modi government has ‘dared to take bold and futuristic decisions for the welfare of 130 crore Indians’. Bahujan Samaj Party supremo Mayawati took to Twitter to criticise the ‘anti-poor and pro-capitalist Modi government’ and maintained that the new government, after the elections must function in a constitutional manner. Read full story here. During his address to the media, CEC Arora had said that a large contingent of security forces are required to ensure the protection of every J&K candidate. "This was a categorical demand from all political parties there. The availability of security forces is a constraint," he said. Q: If EC can hold LS poll in J&K, then why not state elections? Describing the poll panel’s decision to not hold assembly elections in the state as “surrender to Pakistan, to militants and to the Hurriyat”, Omar Abdullah said, "In light of the failure to conduct assembly elections on time in J&K I’m retweeting my tweets from a few days ago." He added, “PM Modi has surrendered to Pakistan, to the militants & to the Hurriyat. Well done Modi Sahib. 56-inch chest failed. #slowclap." Read full story here. When asked if the Ministry of Home Affairs had not agreed to the EC's demands for security forces for J&K polls, Arora said, "The availability of central forces is definitely not an issue. You cannot disregard recent events. The EC cannot be non-cognisant of the situation on the ground and the feedback of the state administration." Upset with the EC's decision to not hold bypolls in J&K simultaneously, former J&K chief minister Omar Abdullah said, "What happened to Rajnath Singh’s assurance to Lok Sabha and Rajya Sabha as well as to the all-party meeting recently in Delhi that all forces would be made available for simultaneous polls?" Urging citizens to give yet another term to the Modi government, the PM said, "Guided by ‘Sabka Saath, Sabka Vikas’, NDA seeks your blessings again. We spent the last five years fulfilling basic necessities that were left unfulfilled for 70 long years. Now, the time has come to build on that and create a strong, prosperous and secure India. #PhirEkBaarModiSarkar." "Polling in Jammu and Kashmir's Anantnag Lok Sabha seat will be held in three phases due to security reasons," the Election Commission announced. Assembly polls in Andhra Pradesh, Arunachal, Odisha and Sikkim will be held with Lok Sabha polls, the poll panel head announced. "Ninety-one constituencies will go for polls in the first phase of polls, 97 constituencies in the second phase. A total of 115 constituencies will go for polls in the third phase, 71 in the fourth phase, 51 in the fifth phase, 59 in the sixth and 59 in the seventh phase," Arora said. "Andhra Pradesh, Arunachal Pradesh, Goa, Gujarat, Haryana, Himachal Pradesh, Kerala, Meghalaya, Mizoram, Nagaland, Punjab, Sikkim Telangana, Tamil Nadu, Uttarakhand, Andaman and Nicobar, Dadra and Nagar Haveli, Daman and Diu, Lakshadweep, New Delhi, Pondicherry and Chandigarh will go for a single phase," Arora said. Speaking on the election schedule, CEC Sunil Arora said, "Elections will be held in seven phases. Counting of votes will take place on May 23." As a "major tool of empowerment", the Election Commission has decided to protect the identity of those who wish to lodge complaints of malpractices across booths. "We will publish the measures/actions taken against the accused in local newspapers for the complainant instead. Any citizen can report Model Code of Conduct violations on EC's C-VIGIL app. In the last five Assembly polls, 28,000 such complaints were received," Arora said. "Adequate deployment of security forces has been arranged. We cannot provide numbers and more information on this since the information is sensitive," the poll panel head said. "In the wake of complaints regarding the security of EVMs, the last mile transportation of these machines will be tracked through GPS," Arora said. "Voter-verifiable paper audit trails (VVPATs) will be used along with electronic voting machines (EVMs) in all the booths. A total of 17.4 lakh VVPAT units will be used," Arora said. Continuing his address, the CEC said, "Photo voter slips cannot be used as standalone proof of identity at the time of casting vote. Instructions of this effect have been issued already by EC. Approximately, 10 lakh polling stations will be set up this time as opposed to the nine lakh polling stations that were set up in 2014." "There are 900 million voters in total. Exams, festivals and weather were taken into account while preparing the schedule. Several rounds of discussions were also held with the Home Ministry. We also visited states to review the level of preparedness," Arora said. In the run-up to the high-stakes polls, several Opposition parties have banded together in the hope of wresting power from the BJP, which registered a thumping victory in the 2014 polls. The term of the 16th Lok Sabha will come to an end on June 3, 2019. According to an analysis by PRS Legislative Research, 133 bills were passed during the 16th Lok Sabha, which held sessions from June 2014 and February 2019. The House worked a total of 1,615 hours — 40 per cent less time than the average number of hours (2,689) spent by previous Lower Houses that completed full-term. For the 2014 general elections, the EC announced the dates on March 5.